Your conservatory is a huge capital asset but over time moss and algae can lead it to look unsightly and cause degradation to external glazing bars and the seals, thus ncreasing the possibility for leaks. 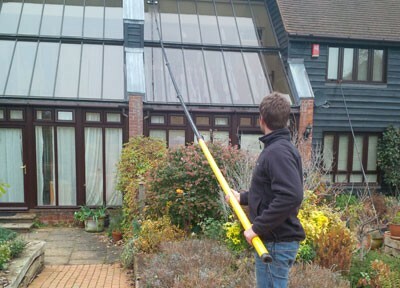 Our professional conservatory cleaning service restores your conservatory back to its former glory, in fact, the light will come flooding back in! We clean from top to bottom, scrubbing from the roof and frame downwards, cleaning out the gutters and downspouts and we check all the fixings and seals. Our cleaning method reduces the need to scaffold or use lifting equipment as most of the area will be reached from the ground with pure water fed pole. The pure water consumes algae from glass and frames leaving it looking like new. It also means that No harmful chemicals are used. Our service is quick, effective and is no risk to your plants or lawns. If your conservatory could use some restoration, please contact today for a free quotation.